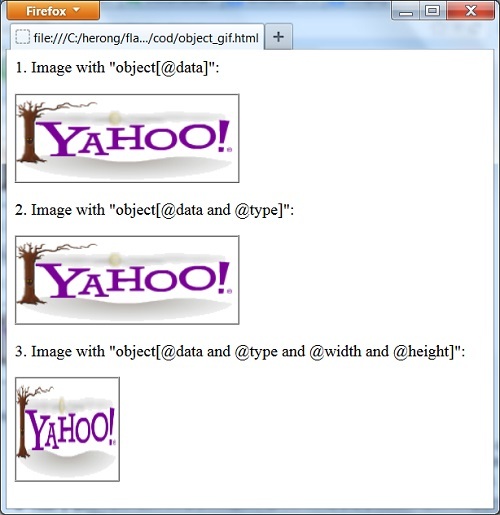 This section provides a tutorial example on how Firefox 26 renders images specified in 'object' elements. Test 1 shows that Firefox 26 is smart enough to use the file name extension .gif to determine the content type. The image is display properly in its original size, if "width" and "height" attributes are not provided. Test 2 shows that Firefox 26 does not respect the "type" attribute, "audio/x-wav". Firefox seems to be detecting the data type by the file extension. Test 3 shows that Firefox 26 stretches the image size to match what is specified in "width" and "height" attributes.